My friend Fidel comes from Alcoy, a beautiful small town on the Mediterranean coast. It is through him that I learnt properly about Moros y Cristianos. 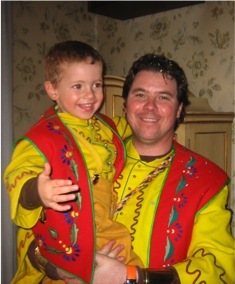 Well, through him and his son Alvaro, who very kindly shared with me the school presentation he did on this fiesta. 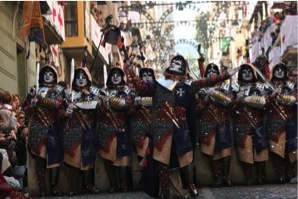 This Moros y Cristianos tradition recreates a very specific battle that took place in 1276 in Alcoy. On the 23 April, having lost the city to the Kingdom of Valencia (Spain has quite a tradition of division, it was made up of lots of separate kingdoms until 1492) the Moors tried to conquer the city once more under the leadership of “el azul”, (the blue one), Al-Azraq – blue due to the colour of his eyes. A bloody battle ensued between Muslim and Christian troops. When it seemed inevitable that the Arabs were going to win the battle, a mysterious male figure appeared, riding a white horse and displaying a red cross on his chest. With one blow, the warrior, identified by the Christian troops as St Jordi (patron saint on that day), took the life of the Arab leader, causing the rest of his troops to disperse. The result of such an important day (the Spanish got their city back) is celebrated in Alcoy over three days no less. This trilogía runs from 22 to 24 April. The first day features different music bands playing through the streets of Alcoy and it ends with the whole town eating an olleta alcoyana, a caserol-type dish including pork, beef, potatoes, beans and morcilla, a kind of sausage made of pig’s blood and meat. The following day starts early. At 6am, the trumpet sounds and both sets of troops parade through the city as the sun begins to rise. (My friend Fidel has impersonated a Moor for ages.) A beautiful reconstruction of medieval times ensues, with the Christian side parading in the morning and the Moorish side taking over the streets in the afternoon. The second day is dedicated to St Jordi. 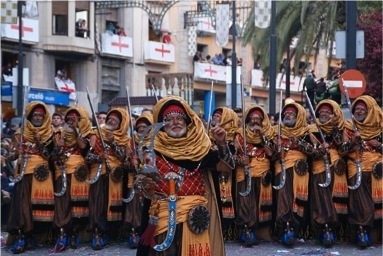 It consists mainly of procesiones similar to those seen during Easter, but featuring an image of St Jordi which is carried from church to church. On the last day, the whole thing explodes. Literally. Gunpowder features heavily on this day as the battle between Moros and Cristianos is reconstructed, showing the Moors victorious in the morning while in the afternoon, the Christians are able to take the city back. Plenty of noise and celebratory behaviour then, but not nearly as much as that which you can see in Las Fallas in Valencia. Madrid from the rooftops. Loving the contrast between modern, urban Madrid and the old-fashioned “barrio” with the “abuelos”. Thanks Kevin for the pics!